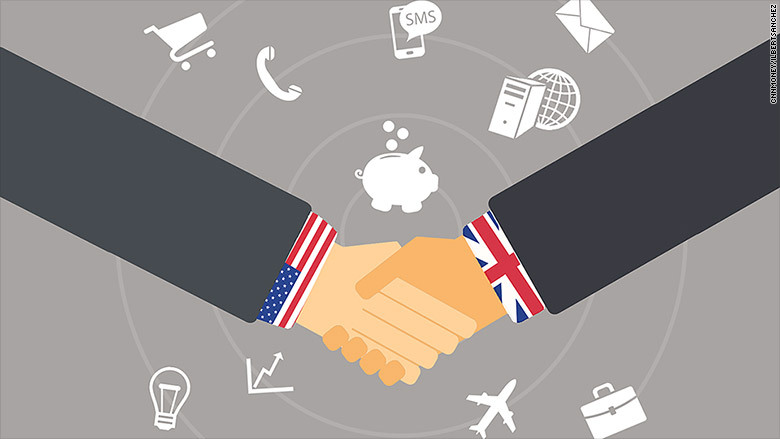 U.S. and UK: Best business buddies? President Obama and British Prime Minister David Cameron were once heard calling each other "bro." But is the relationship between their two countries really all that special, and will it survive next week's general election? 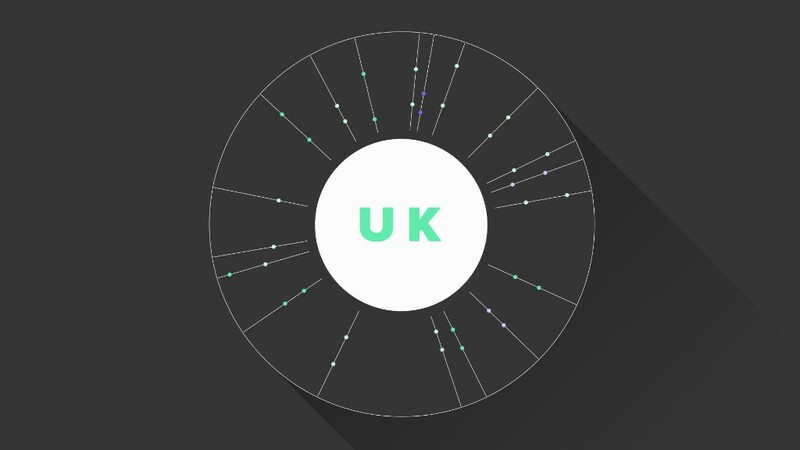 The numbers show that British-American links are strong -- especially when it comes to business. The U.S. is Britain's biggest single trading partner: Trade between the two amounted to more than $200 billion in 2014. That includes $767 million from television programs such as Downton Abbey and Sherlock, $306 million in Scottish salmon, and gin worth $207 million. The two also enjoy strong financial ties. The U.S. invests more in Britain than any other country in the world, and the U.K. accounts for 27% of all American investment projects in Europe -- by far the biggest share. Related: Is Britain booming, or barely coping? U.S. companies find Britain attractive due to low tax rates and an environment that is friendly to business, as well as the access they enjoy to the single market of the European Union. Workers on both sides of the Atlantic benefit too. While a million Brits work for American companies in the U.K., a million Americans work for British companies in the United States. Many big U.S. companies have their European headquarters in Britain. Google (GOOG), Microsoft (MSFT), Cisco (CSCO), J.P. Morgan (JPM) and Deloitte all rank in the top 10 most desirable companies to work for in the U.K., according to Glassdoor recruitment website. Researchers from Ernst & Young say the strength of the relationship has been key to Britain's ability to grow faster than the rest of Europe. "The U.K.'s continuing lead in Europe is largely due to its position as US investors' destination of choice," EY said in a report last year. The term "special relationship" was first coined by British wartime Prime Minister Winston Churchill, and has been reaffirmed throughout the decades by close cooperation between leaders. Like most relationships it has been strained at times. Obama initially appeared warmer to Germany and France, and was reported to have snubbed former Prime Minister Gordon Brown. Obama is a lot more friendly towards Cameron, Brown's successor, but the tension could rise rapidly in coming months if the prime minister retains office after the general election on May 7. That's because Cameron has promised to hold a referendum over the next year or two on whether Britain should quit the European Union. A decision to leave the EU could make life much harder for American companies who have based their regional operations in the U.K. The U.S. is quite open about the fact that Britain's membership of the European Union is vital to their friendship. The White House has repeatedly emphasized the importance of "a strong, outward looking Europe with a strong Britain at the heart of it." Obama's former assistant secretary of state for Europe, Phil Gordon, spelled it out: "We want to see a strong British voice in that European Union. That is in the American interest." John McCormick, a professor of European Union politics at Indiana University, goes further: "The U.S. will be much less interested in Britain if it leaves the EU." Britain's exit from the bloc could hurt its economy too. "It seems quite likely that many U.S., Japanese and Chinese companies would scale back or avoid investing in a UK that was not part of the EU," he added. Competition for influence in Asia is also causing strains. Just a few weeks ago, the U.K. became the first major developed economy to sign up as a founding member of China's Asian Infrastructure Investment Bank -- ignoring attempts by the Obama administration to persuade its allies to stay on the sidelines.